E-Safety and cyberbullying. What actually is E-Safety? 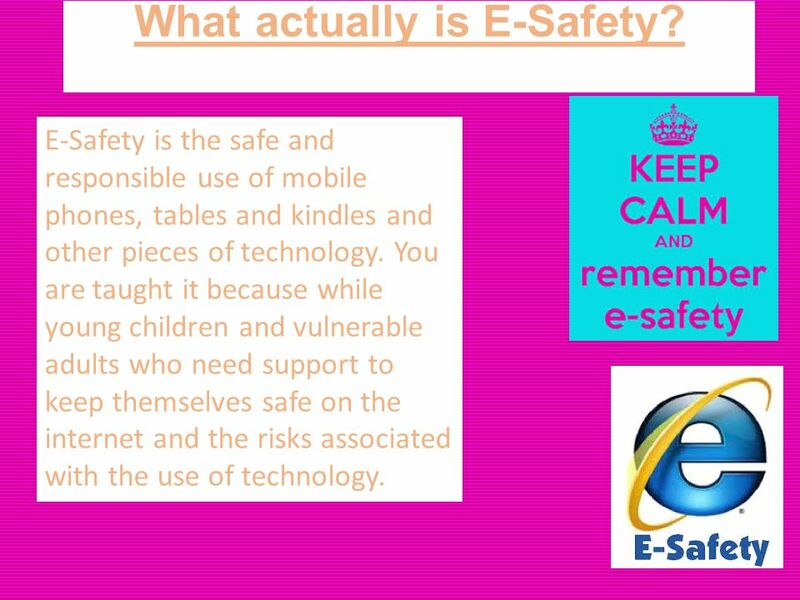 E-Safety is the safe and responsible use of mobile phones, tables and kindles and other pieces. 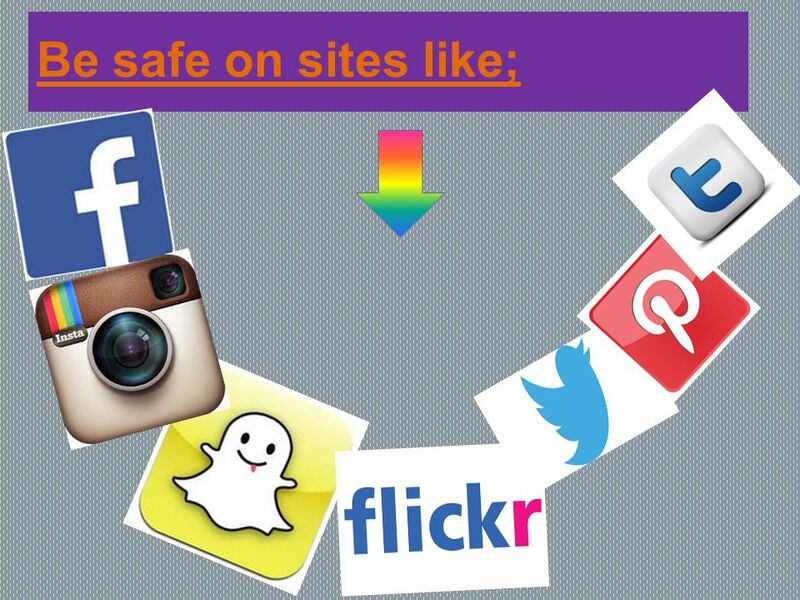 2 What actually is E-Safety? E-Safety is the safe and responsible use of mobile phones, tables and kindles and other pieces of technology. You are taught it because while young children and vulnerable adults who need support to keep themselves safe on the internet and the risks associated with the use of technology. 4 Why should you be careful on these sites? You should be careful on any app that people can add you because someone could create a fake account. So you could think your talking to someone your age but you could be talking to a 27 year old man. NEVER tell anyone any details about yourself because they could do something very bad with the information. If anyone ever asks for your name, do not tell them just say I’m not allowed to talk to strangers. 5 How can I be safe on the internet? 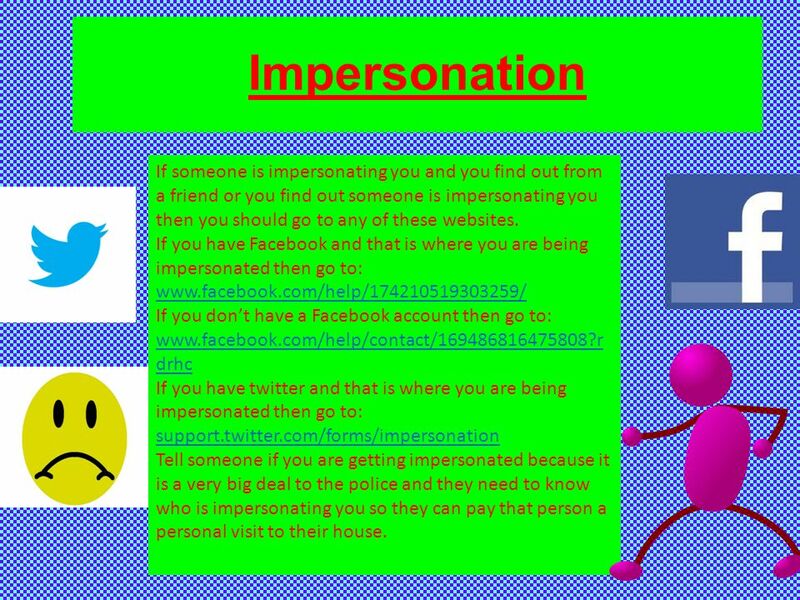 You can be safe by not telling anyone your personal information e.g. name, street name and house number, age or any of your email or other passwords. 6 Why you shouldn't post anything bad on anyone's timeline? When Sarah was younger someone put on her status that she was a slag. 10 years along the line she is a single mother with 2 kids and wants to start dating again. The man she is going on a date with decides to google her. He finds the comment and decides that he doesn't want to spend time with a woman who was called a slag and decides not to go on the date with her and cancels. 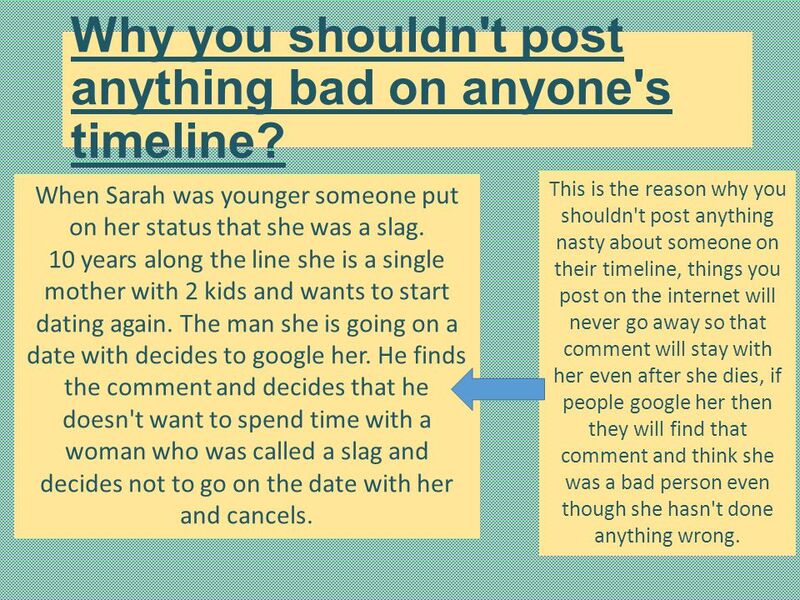 This is the reason why you shouldn't post anything nasty about someone on their timeline, things you post on the internet will never go away so that comment will stay with her even after she dies, if people google her then they will find that comment and think she was a bad person even though she hasn't done anything wrong. 7 Don't say words or phrases you don't know the meaning of. You shouldn't say words or phrases you don't know the meaning of. Just because you think it's banter you still shouldn't say it. 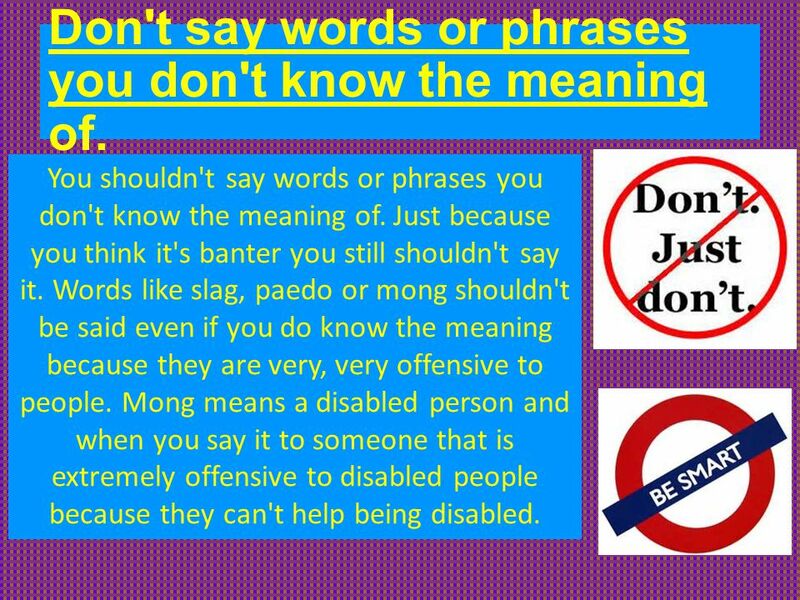 Words like slag, paedo or mong shouldn't be said even if you do know the meaning because they are very, very offensive to people. Mong means a disabled person and when you say it to someone that is extremely offensive to disabled people because they can't help being disabled. 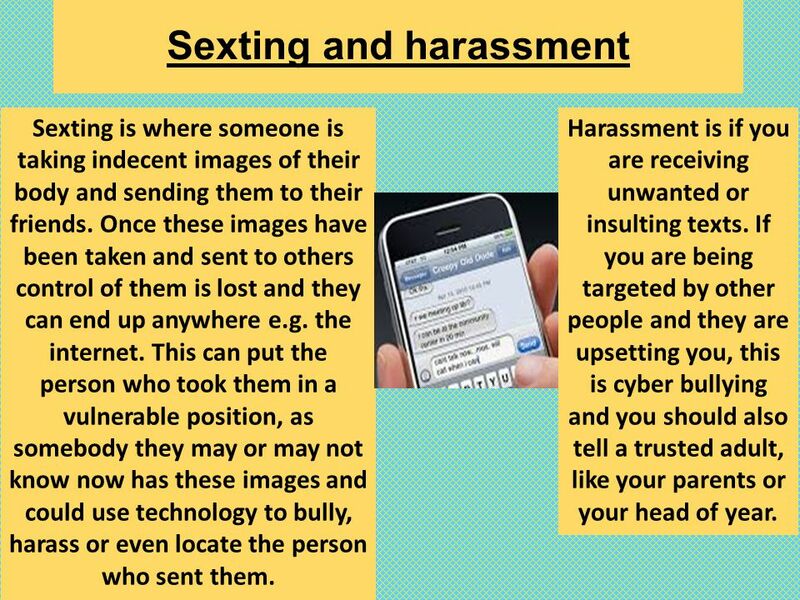 8 Sexting and harassment Sexting is where someone is taking indecent images of their body and sending them to their friends. Once these images have been taken and sent to others control of them is lost and they can end up anywhere e.g. the internet. This can put the person who took them in a vulnerable position, as somebody they may or may not know now has these images and could use technology to bully, harass or even locate the person who sent them. Harassment is if you are receiving unwanted or insulting texts. 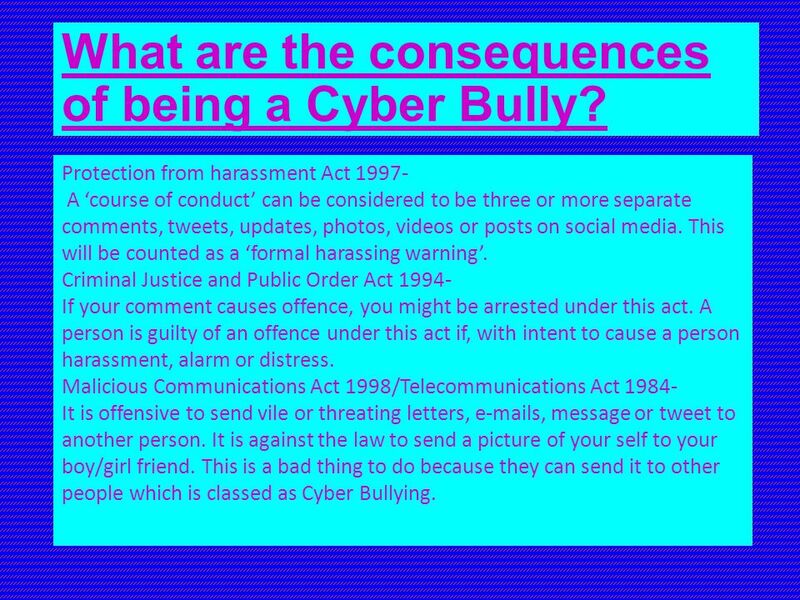 If you are being targeted by other people and they are upsetting you, this is cyber bullying and you should also tell a trusted adult, like your parents or your head of year. 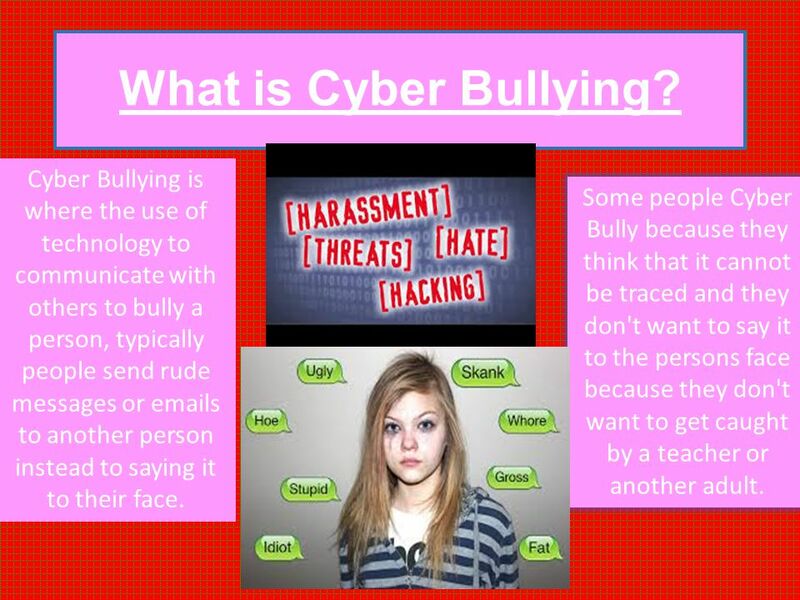 9 What is Cyber Bullying? Cyber Bullying is where the use of technology to communicate with others to bully a person, typically people send rude messages or emails to another person instead to saying it to their face. Some people Cyber Bully because they think that it cannot be traced and they don't want to say it to the persons face because they don't want to get caught by a teacher or another adult. 10 What are the risks of bullying? The risks of bullying are endless. If you bully someone is going to end up finding out about it. If you bully the victim can cause harm to themselves, or even try and attempt suicide. This is very dangerous and can get to in alto of trouble you might even get sent to prison for making someone kill themselves. So zip it, block it and flag it. If you are getting bullied don't tell your friends first tell an adult it can make a very big difference. 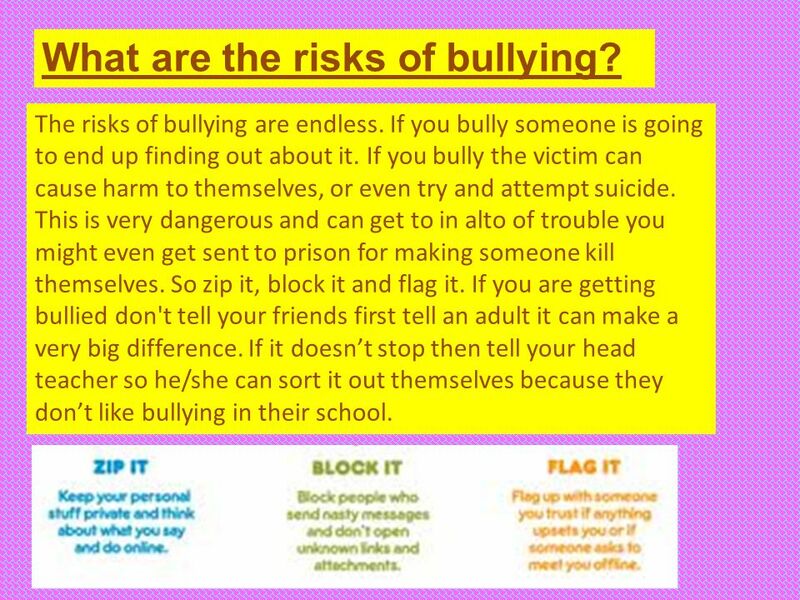 If it doesn’t stop then tell your head teacher so he/she can sort it out themselves because they don’t like bullying in their school. 11 what are the risks of the victim being bullied ? The risks for the victim are self harm, insecurity, scared to go anywhere and in some cases even suicide attempts. 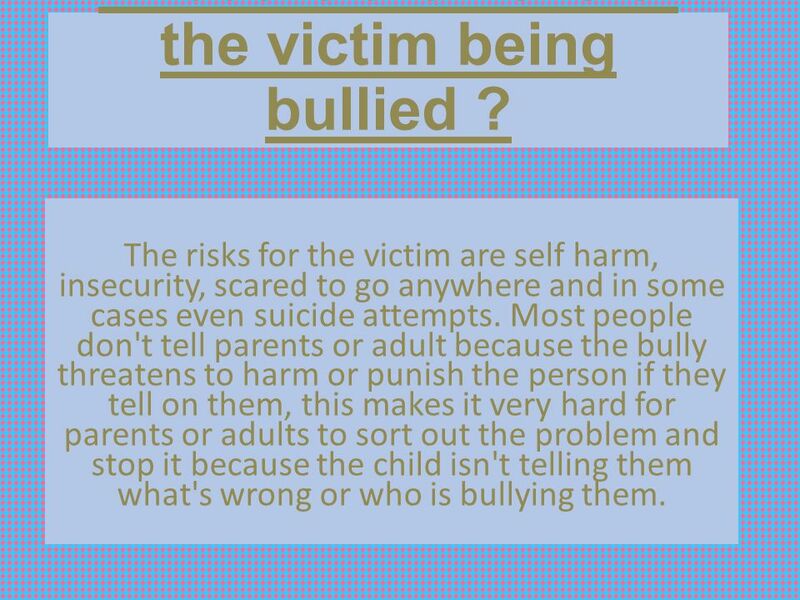 Most people don't tell parents or adult because the bully threatens to harm or punish the person if they tell on them, this makes it very hard for parents or adults to sort out the problem and stop it because the child isn't telling them what's wrong or who is bullying them. 12 Why do some people bully? Some people bully because they are jealous of the person/people they are bullying. Another reason is because they feel insecure that they have to harm other people to get friends or attention because they don't get attention at home. 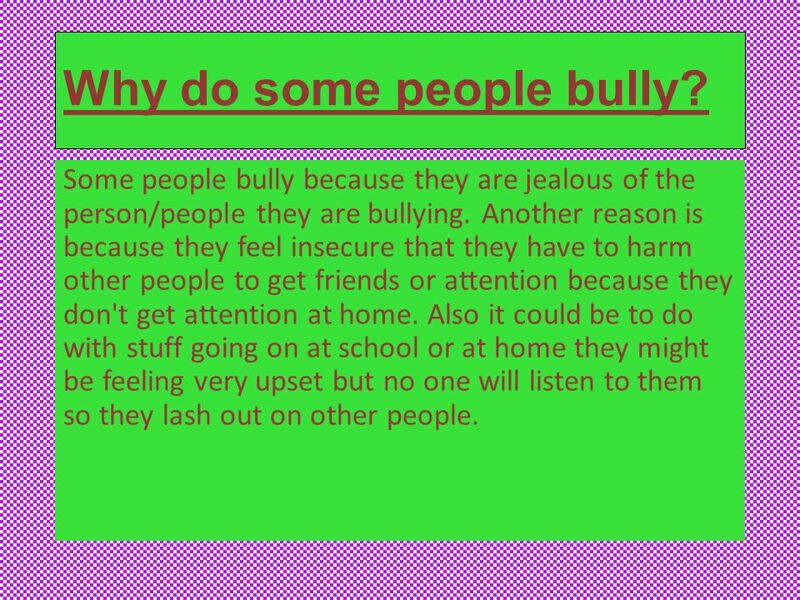 Also it could be to do with stuff going on at school or at home they might be feeling very upset but no one will listen to them so they lash out on other people. 13 Is there an increase in Cyber Bullying? 14 What should you do if you are getting Cyber Bullied? The first thing you should do is screenshot the rude comments or messages or emails. 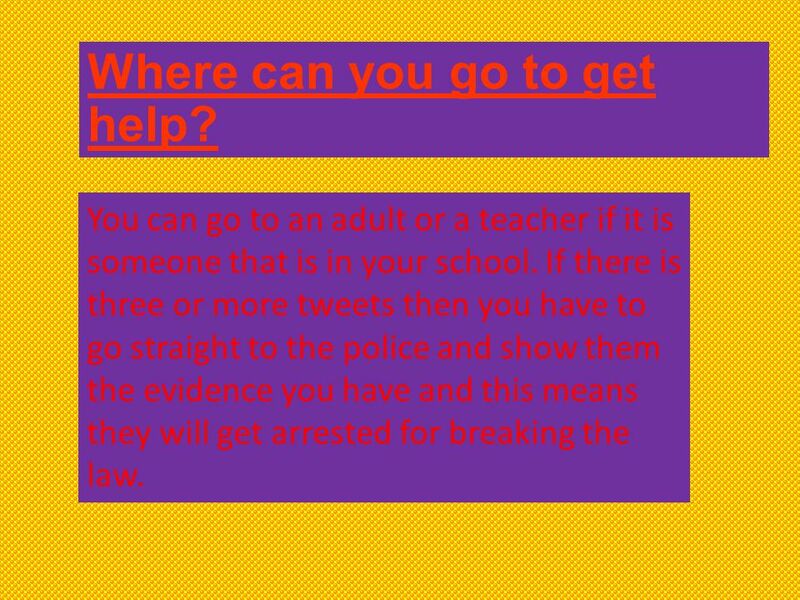 Then you should show the screen shots to an adult and tell them the persons name and leave them to deal with it but if it carries on go to the police with all of the screen shots. 15 What are the consequences of being a Cyber Bully? Protection from harassment Act 1997- A ‘course of conduct’ can be considered to be three or more separate comments, tweets, updates, photos, videos or posts on social media. This will be counted as a ‘formal harassing warning’. Criminal Justice and Public Order Act 1994- If your comment causes offence, you might be arrested under this act. A person is guilty of an offence under this act if, with intent to cause a person harassment, alarm or distress. Malicious Communications Act 1998/Telecommunications Act 1984- It is offensive to send vile or threating letters, e-mails, message or tweet to another person. It is against the law to send a picture of your self to your boy/girl friend. This is a bad thing to do because they can send it to other people which is classed as Cyber Bullying. 16 Where can you go to get help? You can go to an adult or a teacher if it is someone that is in your school. If there is three or more tweets then you have to go straight to the police and show them the evidence you have and this means they will get arrested for breaking the law. 17 Impersonation If someone is impersonating you and you find out from a friend or you find out someone is impersonating you then you should go to any of these websites. If you have Facebook and that is where you are being impersonated then go to: www.facebook.com/help/174210519303259/ If you don’t have a Facebook account then go to: www.facebook.com/help/contact/169486816475808?r drhc If you have twitter and that is where you are being impersonated then go to: support.twitter.com/forms/impersonation Tell someone if you are getting impersonated because it is a very big deal to the police and they need to know who is impersonating you so they can pay that person a personal visit to their house. 18 Pictures You should only take a photo if it is funny and meant to make people laugh or if it is sensible and will not cause any offence or concern to other people. 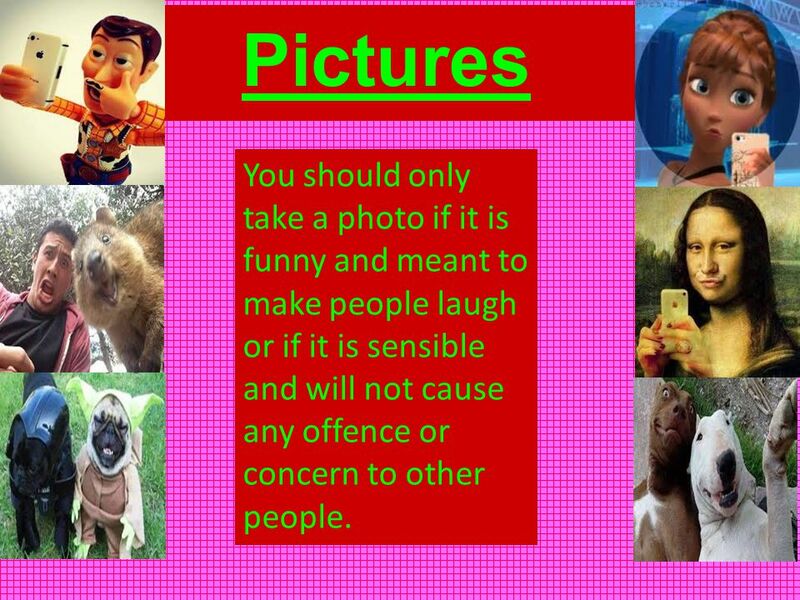 19 I would like you to go away and think about what you have learnt in this PowerPoint. 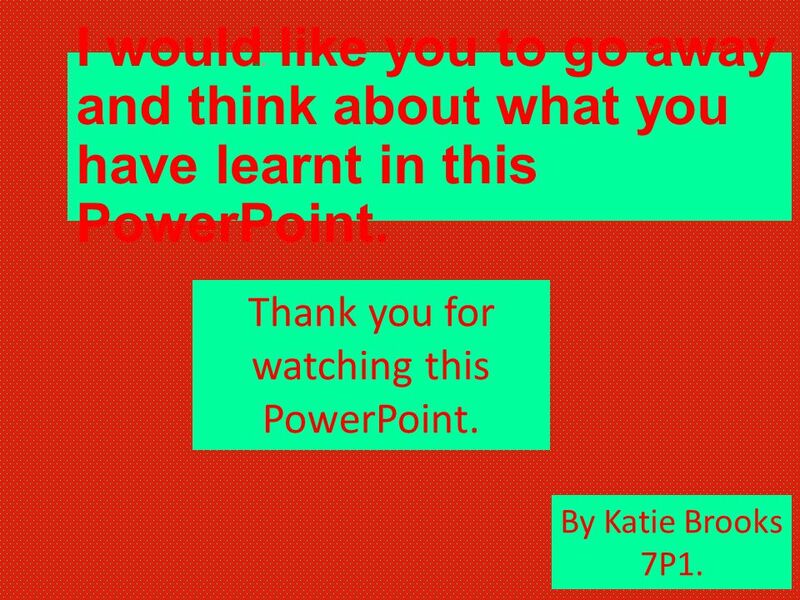 Thank you for watching this PowerPoint. By Katie Brooks 7P1. 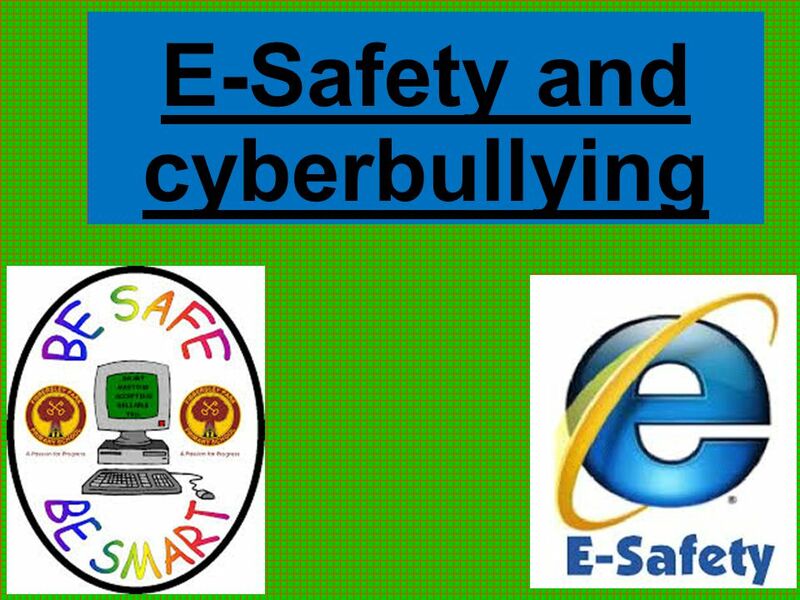 Download ppt "E-Safety and cyberbullying. What actually is E-Safety? E-Safety is the safe and responsible use of mobile phones, tables and kindles and other pieces." 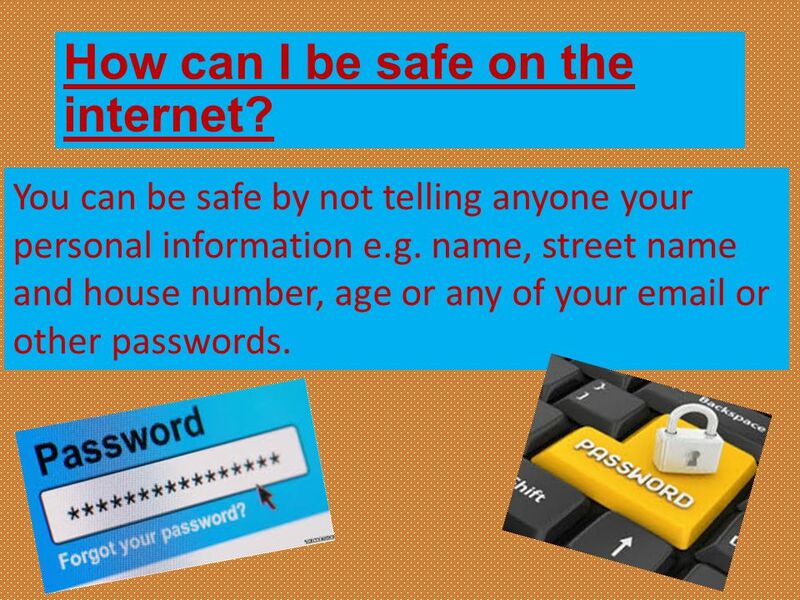 E - safety How e-safe are you?. SESSION TEN Online Relationships. Social Networking Sites There are a number of things to think about when using social networking sites: Be careful what. 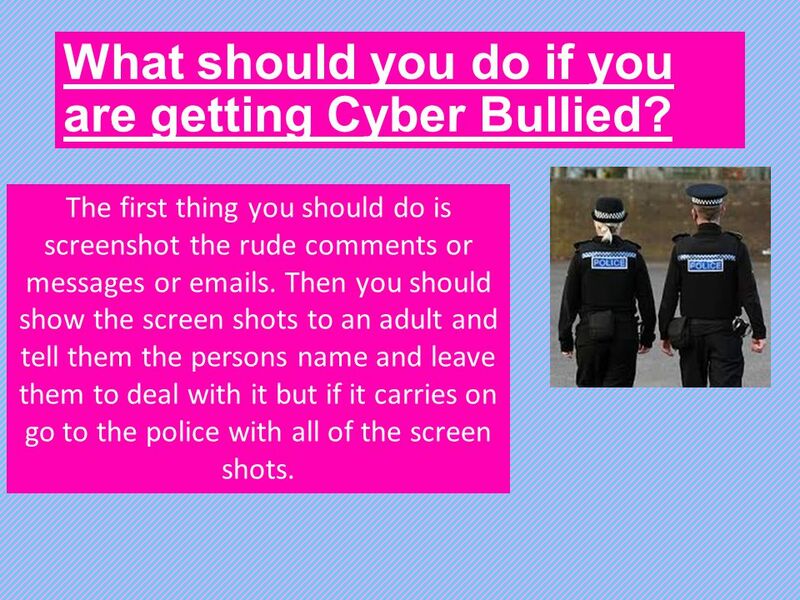 Cyber Bullying Everything you need to know. How is it different from normal bullying? By using technology like mobiles or the internet, this type of bullying. BULLYING and Bullying behaviour is no longer restricted to the school yard. It is often by phone or online and out of sight and earshot of both teachers. Internet Online Safety How to have FUN and Stay in Control. FtbaKIYyg Article 29 (goals of education) Education must develop every child’s personality, talents and abilities to. Cybersafety Elimbah State School Cybersafety and cyberbullying: A guide for parents and caregivers, May 2012., Dept of Education, Training and Employment. Cyber-bullying Why We are Mean to Each Other and How We Can Change. What is Cyber-Bullying? 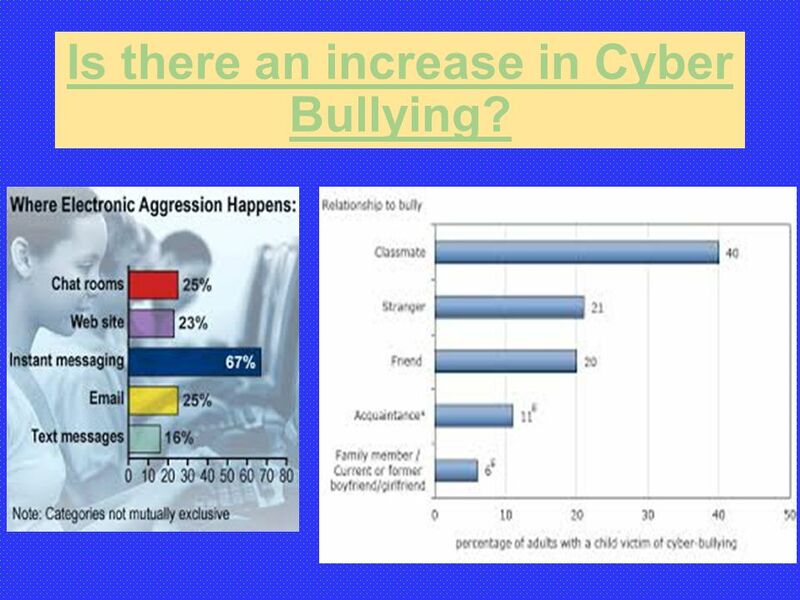 Cyber-Bullying is the use of technology to harass, threaten, embarrass or target another person. Social Networks Instant.